X, a seminal punk new wave band from the 70’s/80’s played the House of Blues on Saturday. Hanging out on Lansdowne Street before the show was reminiscent of those heady years. Concertgoers mingled with people waiting to get into Fenway, the excitement in the air was almost palpable. Opening that night was a local band, Mean Creek. Mean Creek has been moving quickly thru the Boston music scene after first getting together in 2009. They were then named "Best Boston Act" by Boston Phoenix in both 2010 & 2011. In 2012, their third album, Youth Companion, won "Album Of The Year" in the Boston Music Awards. Influenced and inspired by bands from the Eighties like Mission of Burma, Dinosaur Jr., and The Lemonheads, they continue their own style, embracing the punk-alternative sounds that came before them. Their lyrics are poetic, about love, confusion, loneliness, and heartbreak. Their performance though took me by surprise; the volume was cranked to max, and the songs were delivered at full force tearing thru the room. Their seemingly angry, painful, and heartbroken harmonies were backed by soaring guitar riffs, a constant thumping bass, and crashing drums, all working off one another in a rage. Their sound was definitely reminiscent of the eighties and the crowd loved it! After Mean Creek left the stage, people soon got anxious, yelling for their punk heroes to emerge. An intro started, sounding like the tune from The Good, The Bad, & The Ugly, and the members of X soon sauntered on stage with smiles. The crowd went nuts. The room was packed, mostly with those who remember seeing X in the 80’s, but also including a few younger punks. The night was filled with memorable songs with everyone relishing them, singing, dancing, and trying to keep as close to the stage as possible. X was founded in the late 70’s by bassist/singer John Doe and guitarist Billy Zoom. Doe was dating Exene Cervenka at the time, often bringing her to practices. Since she was known for her poetry, Doe finally asked if she’d be interested in writing songs for them. She agreed, but decided if she were going to do that she would have to sing them too. After DJ Bonebrake (from the punk band Eyes) joined as their drummer, they cut their first record together. They then continued with 13 more albums, the last one in 2009, and their music has been used in multiple films. Their well-known, much-loved song Los Angeles is listed as one of the Rock and Roll Hall of Fame’s 500 Songs that Shaped Rock and Roll. They were architects of our modern era of music, being cited as an influence for many bands today, including Green Day. After having just finished up their tour with Blondie, X performed in fine form. They were great, exactly as I remembered them in ’84! Exene was enjoying herself, throwing her long tresses about as she flung out the lyrics. 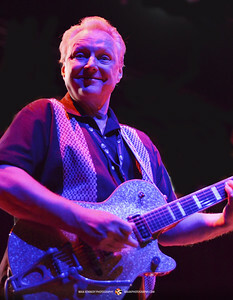 Billy Zoom was in his signature wide stance, strumming away without a care. He would look around the room then down at us with his big Cheshire cat smile. Bonebrake’s drums kept the fire burning and the songs were hot. John Doe deftly provided the bass tones to reinforce the tunes. His voice so familiar, it was as if time had stood still for me. This band seems to thrive on performing and bringing their music to the people who love it. They have a loyal fan base that travels to see them and has followed them through the years. If we’re lucky, X will continue touring and come back to Boston often!